This is a joint post by Guido Grimm and Johann-Mattis List. Mattis’ last two blog posts dealt with problems of what linguists call "structural data". Here we discuss what this means for the inference of relationships between languages. As pointed out before, what is called structural data in comparative linguistics is a very diverse mix of data solely unified by the idea of having some kind of questionnaire that a linguist may use when going into the field and trying to describe a certain language. These questionnaires are a bit different from the traditional concept lists usually used for the purpose of historical language comparison (see the collection of different lists in the Concepticon project by List et al. 2016). The main difference is that they are based on an imaginative question that a field worker asks an informant (which could as well be a written grammar of the language under question). Since questions can be asked in many different ways, while concepts in historical language comparison are usually restricted to the so-called "basic vocabulary", the diversity of structural datasets is much greater than the diversity we encounter when comparing questionnaires based on concept lists. To give a specific example, let's have a look at a the Chinese dataset by Szeto et al. (2018), mentioned in Mattis' blogpost from September. This dataset is now accessible as a GitHub repository (https://github.com/cldf-datasets/szetosinitic). Mattis added some information regarding the different features of the questionnaire. We list these features in slightly abbreviated form in the table below, adding rough categorizations by Mattis in the Comment column. Mattis has tried to characterize the features, i.e. matrix’ characters, by generalizing linguistic categories: "phonological", pointing roughly to questions about pronunciation (the biological equivalent would be phenotypic traits in morphology or anatomy); "lexical", pointing to the words in the lexicon (this would be the DNA of a language); "morphological", pointing to the ways in which words are constructed; and "syntactic", pointing to the ways in which words are combined to form sentences. In combination, “morphological” and “syntactic” are equal to ‘meta-level’ biological traits, such as development-related features, ontogenetic evidence, and biochemical composition — the ways in which the genetic code is expressed or used in a living organism in adaption to the environment. Mattis also flagged some characters as "diachronic", to mark whether the respective feature was selected by the authors due to their independent knowledge about the history of the Chinese dialects. This is something rarely possible in biology, but imagine that we could go back in time to literally observe the evolution of a lineage over a given time-period, and code this observed evolution as traits. Note that this is not entirely science-fiction — there are two examples where we can observe directly pathways of biological evolution: mutation patterns in viruses, and horizontal modification of marine morphs in high-resolution sediment cores. While one can discuss to what degree a certain feature should belong to this category, it is rather obvious that all phonological features are diachronic, because they name distinctions that reflect well-known processes of sound change, which happened in a couple of Chinese dialects and have been proposed in the past by dialectologists in order to classify the Chinese dialects historically. For example, consider feature p-3 of the questionnaire: Does a given dialect have a syllable that ends in [-m]? From the history of the Chinese dialects we know that the [-m] was present in Middle Chinese, but later merged with [-n] and [-ŋ] in many varieties. Given that we know that this happened, and that we know that people have used this to mark a split, especially between the "innovative" dialects in the North and the South, it is clear that this feature bears explicit historical information. The same holds for all phonological features that we find in the data: p-1, the number of different tones in the dialects is again roughly reflecting the differences between languages in the North and in the South (the North having lost many tones); p-2 reflects the retention or specific development of retroflex sounds (similar to sh in English as opposed to s) mostly in the North; and p-4 reflects if a variety has syllables that can end in [-p, -t, -k], again a feature characteristic for the more "conservative" varieties in the South of China. Four lexical features have further been flagged as "semantic"; we query here existing or missing distinctions of concepts. 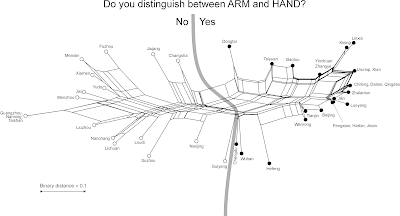 People who learned, for example, Russian or certain German dialects know that it is rather common to have a single word for what other languages call "arm" and "hand" (see the respective entry in the CLICS database) or "foot" and "leg". This diverse feature collection is coded as binary characters, reflected by presence/absence, or a yes/no answer to the question in the questionnaire. The choice of features is very selective. A biological analogy would be a matrix collecting incompatible splits of paternal (molecular) genealogies, along with a few prominent phenotypical traits (reflecting major evolutionary steps), and some traits that we expect to be primarily triggered not by genetics (inheritance) but by expression or adaptation to the environment. Biologists would not phylogenetically analyze such diverse and complex, potentially selection-biased data (although it could be very interesting), but linguists do. In this context, it is remarkable, but also typical for these kind of data, that the 21-character feature collection by Szeto et al. (2018) has no feature in common with the collection by Norman (2003), a 15-character-matrix, which we also converted to our Cross-Linguistic Data Formats (see Forkel et al. 2018) in order to increase the data comparability. Figure 2: A Neighbor-net splits graph of the structural data by Szeto et al. (2018). The typification, coded as binary matrix to infer the Neighbor-net splits graph in Figure 2, demonstrates some basic characteristics of such 2-dimensional graphs. 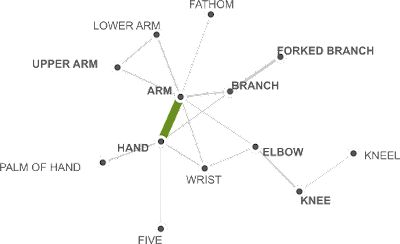 Note four of the 'characters' (typification categories) correlate with an edge(-bundle) in the network, separating the 'taxa' (the queried features). All "semantic" taxa are also "lexical", but "lexical" is more comprehensive, hence, "semantic" is placed as 'descendant' of "lexical" (Neighbor-nets can visualize ancestor-descendant relationships to some degree). "Morphological" taxa are either just "morphological" or also "syntactic", hence the pronounced box. For "diachronic" and "syntactic", we have no corresponding edge(-bundle), because one taxon is also "lexical", but the others are "diachronic" and "syntactic" — this is a conflict that cannot be resolved with two dimensions. To visualize all the resultant 'taxon' splits, called also taxon bipartitions, we would need a third dimension. 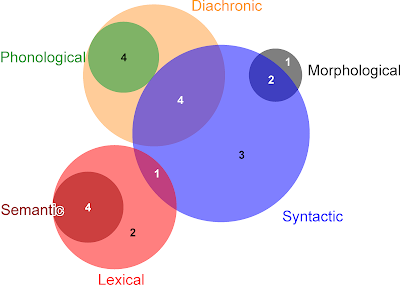 Lacking a third dimension, the Neighbor-net prioritizes keeping most "syntactic" together, because the "diachronic-syntactic" are closer to "syntactic" (max. 1 'character' difference) than to "diachronic-phonological" (2 character difference). 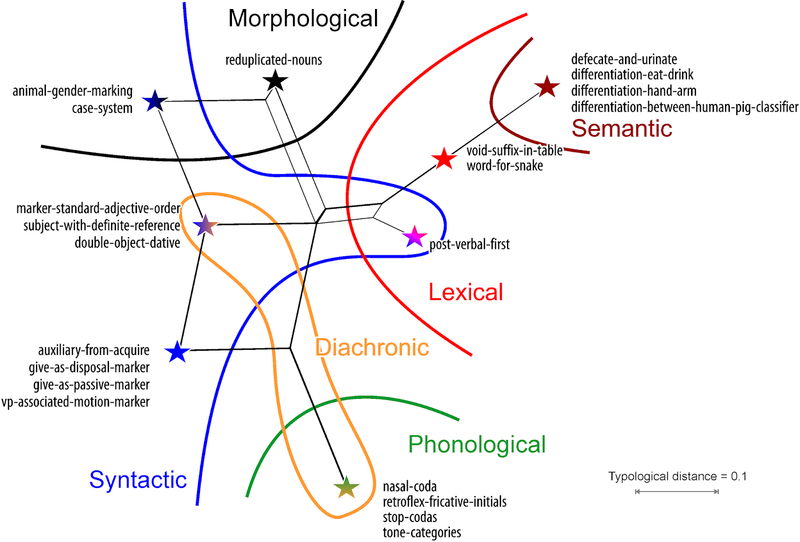 The "syntactic-lexical" has to be placed apart because it is equally close to "lexical" and "syntactic" 'taxa', but differs much from "morphological-syntactic" or "diachronic-syntactic", the closest two relatives of "syntactic"-only 'taxa'. It is resolved closer to the centre of the graph, because it is more closely related to the other "syntactic" taxa than to the rest of the "lexical" taxa. 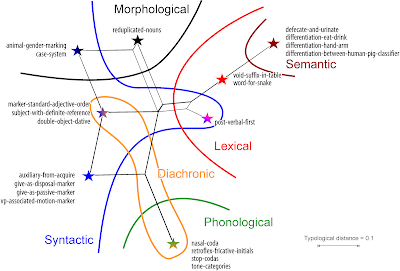 This is also the reason why the "syntactic"-only taxa have to be placed farther out: "Diachronic-phonological" and "syntactic-lexical" are closer to the other endpoints, and the distance of "syntactic"-only to "diachronic-phonological", "lexical" and "morphological" should be as large as possible. Most typologists collecting structural data are not per se interested in phylogenies. Yet, given that scholars deliberately collect historical (diachronic) features, this shows that even if they would not necessarily admit it, they have a genuine interest in uncovering the history of the languages under question; or at least, how closely related languages (or here: dialects) are. But this requires understanding the characters we analyze, the collected "structural data". 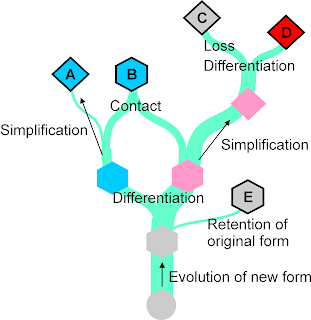 [D] secondary contact, mixing of lineages by hybridization (symmetric mixing) and introgression (asymmetric mixing)? [A]–[C] are vertical processes following a tree, even if the tree does not necessarily need to be the same; [D] is (mostly) horizontal and can only be modeled using a network. For each of the above, we can find an analogy in the evolution of languages. In addition, process , and to a lesser extent , can lead to what biologists call 'homoplasy', meaning that the same feature is observed in two unrelated or distantly related taxa. In the context of phylogenetic inferences, homoplasies inflict tree-incompatible signals, seemingly reticulate patterns originating from a tree-like evolution. Structural (or other) linguistic data and phenotypical biological data have a lot in common — complex processes are boiled down to mere absence or presence of features (or traits, as they are called in biology). Figure 3: Basic evolutionary processes, we need to consider when looking at linguistic data. Or biological traits, when we replace simplification by adaptive evolution, positively selected traits. If we check the features in our table above, and ask: to which degree can they be used to model these processes (see also David's last post on illogic in phylogenetics), e.g. simply distinguish between similarity by chance, relatedness, or secondary contact (mixing), we can easily see that they are by no means optimal for evolutionary investigations. This is not necessarily because of the processes they involve, but more importantly because of the data sampling, which makes modeling almost impossible, with each character needing its own model. As an example, take the feature p-6 in our table. Whether or not a language makes a distinction between "arm" and "hand" does not seem to follow specific geographic or genealogical patterns. The following figure shows a plot from the CLICS database (List et al. 2018), visualizing the most frequently recurring polysemies (or colexifications) centering around the concept "arm". The full visualization in CLICS can be found here, and when hovering with the mouse over the link between "arm" and "hand" (marked in green below). Figure 4: Colexification network in the CLICS database. From eye-balling the data, it is hard to find a consistent geographic / language-family pattern, which suggests that the feature p-6 is likely to show a high degree of homoplasy in the languages of the world. Obviously, different people decided not to distinguish between "hand" or "arm". But, the example of the Sami languages in northern Scandinavia also demonstrate that some people using related, long-isolated languages, consistently don't make the distinction. Here, the homoplasy is inherited (lineage-conserved). A biological analogy would be the rarely applied difference between a 'convergence' (a trait is independently evolved in different lineages) and a 'parallelism' (a trait is expressed by different but not all members of the same lineage). 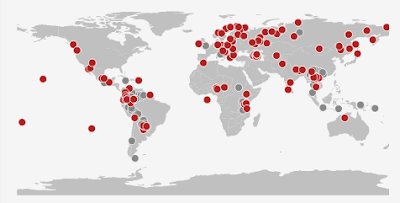 Figure 5: Geographic distribution of arm/hand colexifications in the CLICS database. A specific analogy to the "hand-arm" colexification / differentiation pattern is leaf shedding in oaks and their relatives (Fagaceae, the beech family). Some oak lineages (section Cerris of oaks, beech trees, chestnuts) are essentially or strictly deciduous, others (sections Cylcobalanopsis, Ilex, the sister sections of Cerris; Castanopsis, the sister genus of chestnuts) are always evergreen, and the biggest group (number of species) of all Fagaceae, subgenus Quercus includes evergreen (1 section), mixed (the two by far largest sections), and deciduous (1 nearly extinct section) sublineages. To some extent this is linked to the climate in which the species thrive (high latitudes and/or per-humid = deciduous, low latitude and/or seasonally dry = evergreen), but consistently evergreen and deciduous lineages do co-exist. Looking at the Chinese dialects, we see that p-6 represents a trivial split in the network. Figure 6: A Neighbor-net inferred from the Szeto et al. matrix. Dialects that distinguish "arm" and "hand" with filled dots ('1' for character 6 in the matrix), those that don't ('0') with empty dots. We can put a single line separating all don't- from do-taxa (dialects), i.e. a bipartition of the taxon set fitting the character partition seen in (p-)6. But, given the general patterning of the feature on a global scale, does this really mean that it is inherited — that is, a good feature to reflect relatedness? 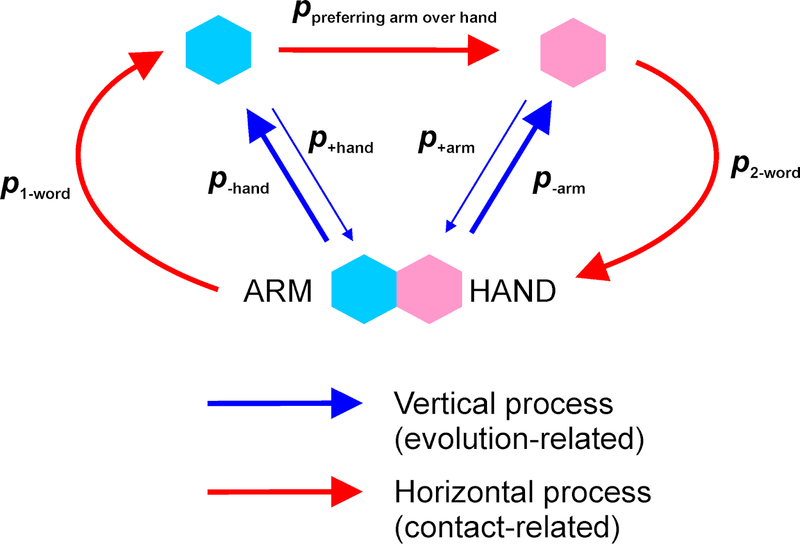 "arm" and "hand" are expressed by different word. We could even have a forth state, in which "arm" and "hand", in the whole long history of the ancestral languages, was always used to express "arm or hand" (i.e., both body parts). No differentiation and no later generalization from either arm nor hand took place. Figure 7: Left, current scoring; right, scoring taking into account the actual mutation process. From Ancient Chinese, we know that "1" (Yes, I do differ between "arm" and "hand") was most likely the original state. We can further assume that once the distinction is dropped, it is less likely to come back again (although this can, of course, also happen). 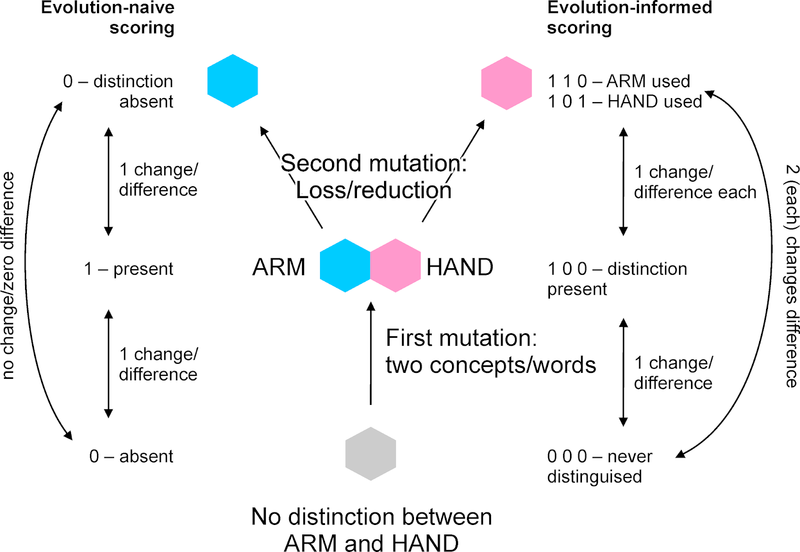 That is, our model involves two possible mutations (vertical process): we lose the word for "arm" due to its replacement by "hand", or we lose the word for "hand" due to its replacement by "arm", each with its own probability. Figure 8: Probability distribution for transitions involving "hand" and "arm". 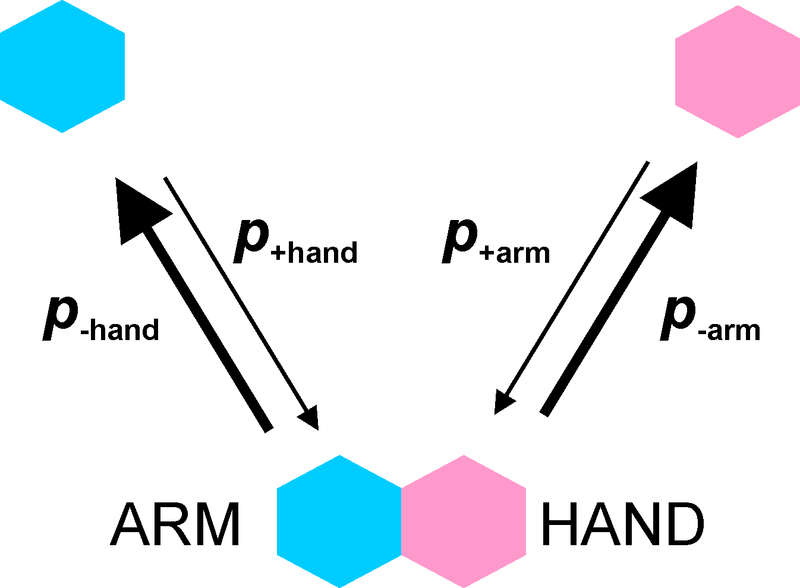 Establishing p-arm (loss "arm") and p-hand (loss "hand") is not trivial, because they may be affected by what is the word for "arm" and "hand" (for simplicity we will assume that p+arm and p+hand are close to 0). We could expect a higher tendency to keep the word that is easier to pronounce or less easy to confuse with other words and, hence, is easier to understand. If two dialects with different states come into contact, this may also influence the decision to take over a state or not. In everyday language, a distinction between "arm" and "and" may be useless because of the clear context in which both words are used, so p1-word > p2-words. However, closeness to administration centers or areas with a higher percentage of educated people could decrease p1-word, because it may be considered a sign of poor social standard to not make the difference between "arm" and "hand". 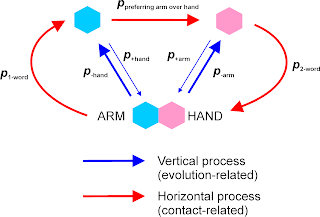 Figure 9: Vertical and horizontal processes involving transitions of "hand" and "arm". Note that this question requires quite a deal of knowledge about the languages under investigation, since it may not be trivial to find out what was the "original" word for "arm" or "hand". 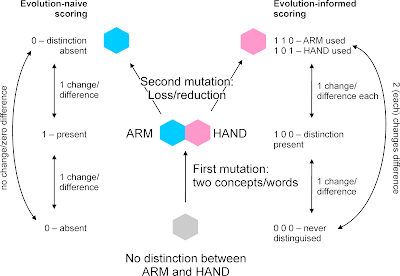 Therefore, a further step would be to replace the binary characters by a value measuring the similarity between the words used for "hand" and those used for "arm". One could again argue that adding this information would add historical information to the feature, but it is clear that the abstract nature of the question is hiding important phylogenetic (and also typological) information from us. 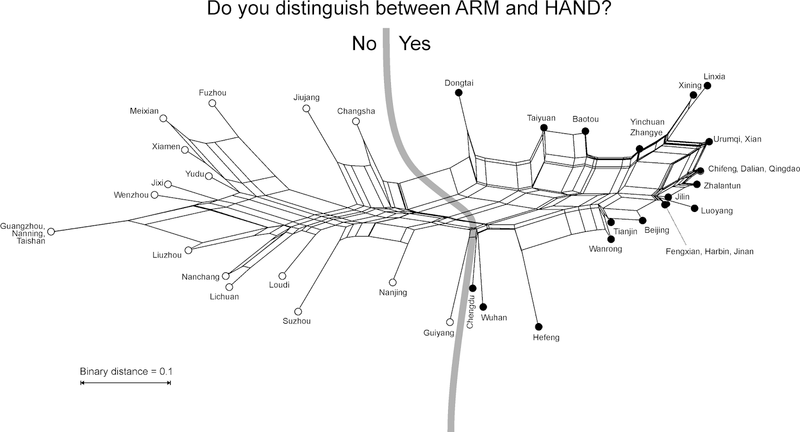 It seems therefore, that, instead of asking whether or not there is a distinction between "arm" and "hand", it would make much more sense to trace the cognacy (or homology) of the expressions for "arm" and "hand" across all taxa (languages, dialects), and think of ways how this could be scored and modeled by phylogenetic analyses. The structural data framework with its features based on simple yes-no questions therefore inevitably leads to a misinterpetation of processes when analyzing the data with phylogenetic software. In reality, structural (or other) data sets in linguistics face problems similar to the ones palaeontologists face when trying to establish phylogenetic relationships between fossils (extinct organisms) — the probability for a mutation (visible change) is largely unknown, and differs not only from character to character but also within the same characters. A state 0, 1, 2 etc. may have a higher probability to manifest (or get lost) in one lineage than in another. In addition, the linguistic problems recur in a similar way to that of biologists working close to and below the species level (see also Guido's post on population dynamics and individual-based fossil phylogenies) — reticulation is rather the rule than the exception, as similarity is triggered by contact, so that horizontal processes, not inheritance, may dominate evolutionary dynamics. Thus, the diversity pattern cannot be modeled by a tree alone. Establishing explicit probabilistic frameworks to deal with this may not only be difficult but even impossible (given the available data). Meanwhile, however, one can embrace exploratory data analysis as a heuristic tool. So, let's look at the example. As in the original paper, we used the binary matrix of the 21 characters to infer a planar, 2-dimensional (meta-)phylogenetic network, a Neighbor-net splits graph. The resulting graph is a longitudinally inflated spider-web, with its endpoints defined by the southern Chinese dialects (e.g. Guangzhou, Nanning, Taishan) and the north-central (eg. Linxia and Xining) dialects. The latter are significantly closer (geographically and data-wise) to the Bejing version of Chinese. The first thing to note is that the matrix includes dialects that are indistinct (green stars) for all 21 characters, and some that are geographically and data-wise very similar to each other, while being distinct from all others (green ovals). In biology, we call this (taxic, lineage-)coherence. In addition to Linxia and Xining, we have Nanchang and Lichuan characterized by elongated ('tree-like') terminal edge-bundles. These obviously represent closely related dialects sharing a long(er) common history. Others have more than one possible closest relative. For instance, Liuzhou may share quite a few features with Guangzhou, but it is equally close to the Nanchang-Lichuan pair (yellow fields). Dongtai (orange star) is unique, but its 'neighborhood' (orange-ish brackets) as defined by shared edge-bundles that include Changsha (which again is most related to Jiujang) and Taiyuan plus Baotou, the latter two substantially closer to the Bejing (red star) group. Similar to Dongtai, and also connected to the central part of the graph, are dialects with long-terminal branches (edges). Hefeng (blue star) is substantially different from Dongtai, and only has one further dialect in its neighborhood (blue bracket), Wangrong, a close relative of the Bejing group. The Wuhan, Chengdu, and Guiyang (gray field) dialects appear, on the other hand, to be completely isolated. the data is highly homoplastic, and includes internal conflict. Not so obvious is whether this situation is due to random or evolutionary directed similarity, or reticulation. Since the graph is planar, and puts the Chinese dialects in a circular order, we can order the character matrix accordingly to see how the traits form groups (which could be called cliques in this context). In the next step, we can then map each character onto this network, to see how well they fit with the overall similarity pattern. We showed this above for p-6 (hand-arm-distinction, one split), and here we add a character with quite a poor fit, p-17 (syntactic-diachronic), "give" as a disposal marker. Figure 11: Character mapping for p-17 (filled dots, "give" used as disposal marker; empty, not used), with the p-6 split indicated as well. Red, splits (taxon bipartitions defined by character cliques) that have no corresponding edge-bundle (neighborhood); blue, splits with neighborhood; green, unique, isolated change (deviation from the rule) within the neighborhood. The number of inferred mutations in the map uses Ockham’s Razor, upon which parsimony (tree and network) inference relies as well. Using such a map, we can even provide an estimate for how likely (qualitatively spoken) a change is under the assumption that neighborhoods in the graph represent either exchange (homogenization) between closely related dialects or are inherited, reflecting both horizontal and vertical relatedness. Mapping characters on a 2-dimensional network allows finding a scenario beyond a single tree hypothesis. For p-6, we need just one change (i.e. loss in all more south-bound dialects), but we don't find an edge bundle corresponding to this unique change. Given what we discussed above about p-6, we have more independent losses than the simple reconstructed one. Social preference or general contact for retaining the primitive state of having two words could explain why dialects closer to the Beijing dialect area have a "0", although not all are closely related in general. Figure 12: Alternative scenario for p-17. This is where one needs to consider additional knowledge about the probability of getting or retaining a certain feature. The state shared by most dialects across the entire net is “0”, irrespective of overall similarity, which would make it a natural pick for the primitive state. Thus, assuming four (or more) changes from 0 → 1 (acquisition of the queried feature), rather than two independent acquisitions (starting with the Beijing group; note, the position of the root will not change the number of needed changes), then a loss (1 → 0) in many southbound dialects and a re-gain (0 → 1) in the Nanchang + Lichuan dialects. Figure 13: Fully annotated split network of the data. Changes relating to edge-bundles accordingly colored, arc indicate changes without a corresponding edge-bundle. Note, the prominent yellow split that defines a neighborhood of dialects most similar to the Beijing dialect, albeit there is no character supporting this edge. The rather poor fit of many character splits (cliques) with edge-bundles relate to the fact that we visualize a highly complex diversification (multi-dimensional processes) using a planar, 2-dimensional graph. While this figure may be confusing at first sight, it comprehensively shows what the characters contribute to the overall graph. We can discriminate more-likely from less-likely mutations (how many changes are needed at least), but also the character assemblies shared by putatively closely related dialects. p-3 and p-11 are a typical feature of Guangzhou and allied dialects within the southern Chinese complex. p-3 is also present in Lichuan, and p-11 in Jixi (thus in not so distant dialects). In this re-investigation, we have, once more, commented on the problems we see with the use of structural features for the purpose of historical language comparison and phylogonetic reconstruction. We see the major problems in the (often) unfortunate choice of question, resulting in elicitations of features that cannot be easily modeled with current software for phylogenetic analyses. It is important to keep in mind, in linguistics and phylogenetics, that we can infer trees or networks based on data of no matter what quality and information content. But before we present the result, we should have taken a look at the primary data. Does it fit with the resulting graph, or not? Where does it fit, and where not? Based on this, we can then inquire as to which degree language (or dialect) groups influenced, stabilized or modified each other by geographic proximity. Inference-wise, the natural next step would be to use the information about the minimum number of necessary changes to counter-weight characters. This would eventually allow to use median networks (and related) approaches on the data, which is currently the only way to explicitly identify ancestors using phylogenetic reconstructions. With the current matrices, the extreme homoplasy makes an unweighted application of median networks and related methods impossible. Forkel, R., J.-M. List, S. Greenhill, C. Rzymski, S. Bank, M. Cysouw, H. Hammarström, M. Haspelmath, G. Kaiping, and R. Gray (2018) Cross-Linguistic Data Formats, advancing data sharing and re-use in comparative linguistics. Scientific Data 5.180205: 1-10. List, J.-M., M. Cysouw, and R. Forkel (2016) Concepticon. A resource for the linking of concept lists. In: Proceedings of the Tenth International Conference on Language Resources and Evaluation, pp. 2393-2400. List, J.-M., M. Walworth, S. Greenhill, T. Tresoldi, and R. Forkel (2018) Sequence comparison in computational historical linguistics. Journal of Language Evolution 3.2: 130–144. Norman, J. (2003) The Chinese dialects. Phonology. In: Thurgood, G. and R. LaPolla (eds. ): The Sino-Tibetan languages. Routledge: London and New York, pp. 72-83. Szeto, P., U. Ansaldo, and S. Matthews (2018) Typological variation across Mandarin dialects: An areal perspective with a quantitative approach. Linguistic Typology 22.2: 233-275.